After breakfast, we returned to our room to pack, then back downstairs to check out. There was something wrong with the lift when we went down. It was open on our floor, but unresponsive, and then it seemed to go through a reboot cycle of some sort, and finally descended, except it stopped at the basement level rather than the ground floor whose button we’d pressed. M. got out in confusion, but I called her back in and we risked ascending again, but this time it stopped on the ground floor. As soon as we emerged, Timba was there, saying, “Ah, there you are!” even though it was still several minutes before our designated meeting time of 09:00. We greeted him and said we wanted to get some cash out of an ATM before we drove off, which he said was fine. After checking out of the hotel, I walked with Timba to an ATM nearby while M. stayed and minded the bags. I had to try two different ATMs before finding one that accepted my card and gave me 200,000 shillings. I think we walked down a different street to the one yesterday where there was a Barclays Bank ATM that had worked for me. This time the one I found that worked was inside a small room guarded by a man with what looked like an assault rifle. Returning to the hotel, we climbed into the Land Cruiser and set off the drive to Karatu. 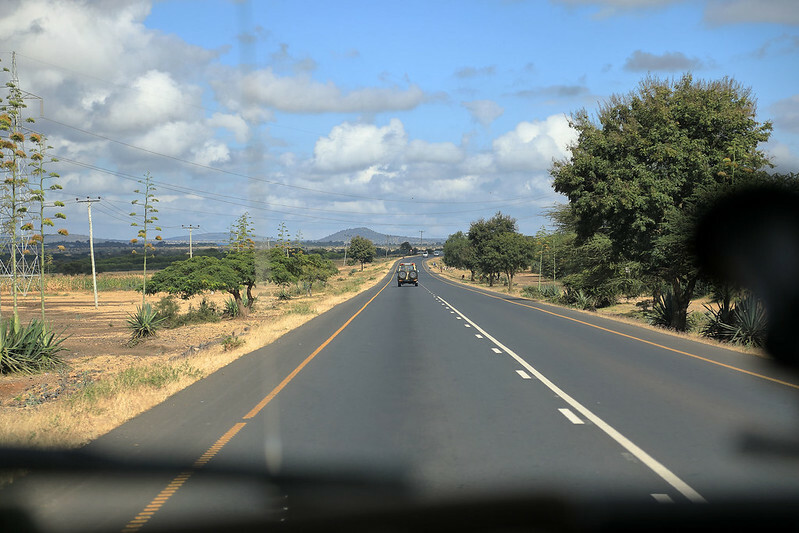 While driving out of Arusha, I asked Timba about all the colourful vans on the streets, if they were buses. He said yes, they are called dala dala, which means “five shillings”, because that was the fare price when they first started, but it’s higher now. He said the drivers are crazy and stop anywhere suddenly if they see a passenger, and they cram the vans with twenty or more people. They are supposed to have marked bus stops, but if you wait at a bus stop, your place in the van might get taken by someone waiting a bit earlier on, so there was no point going to a bus stop. Timba also pointed out motorcycles which act as taxis. They are supposed to only take one passenger, but you can sometimes see bikes with up to four people on them. 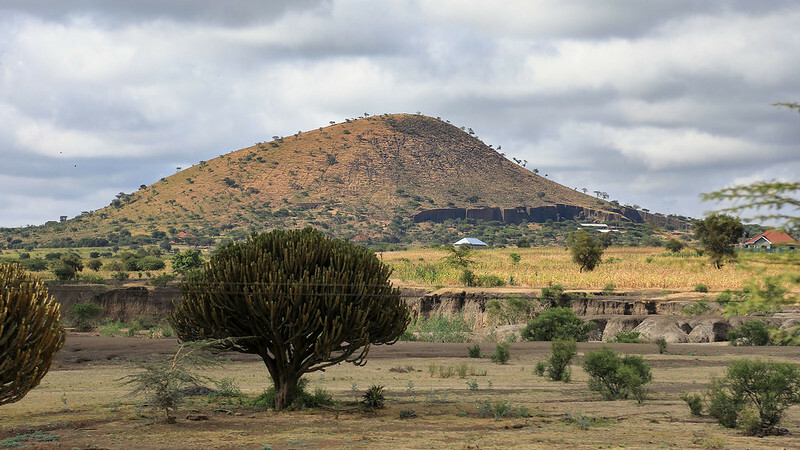 Out of Arusha we passed through a landscape of plains dotted with large rounded hills, many of which are the cores of old volcanoes. Occasionally there were small towns along the road, and even in the countryside between there were a few houses, and people tending cattle or goats. Children with sticks were herding groups of hump-backed cattle along the side of the road. 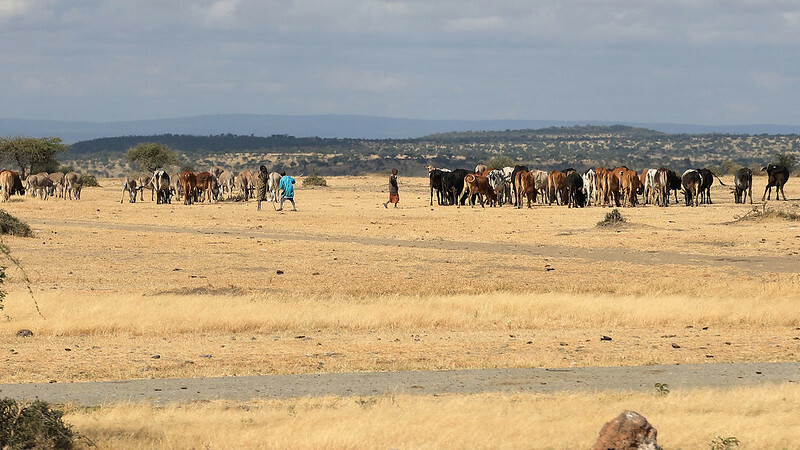 We drove through Maasai lands, seeing many groups of cattle being tended by men in colourful robes and with long sticks. A couple of times we passed small groups of boys by the side of the road, dressed all in black, with their faces painted black with white patterns. Timba explained that these were Masai boys who had just been ritually circumcised, and wearing black with the face paint was part of the months-long celebration of entering manhood. He said that they had to be old enough to withstand the circumcision without moving or crying out in pain. If they fail, they are not treated as grown men by their society, and excluded from adult conversations. We continued driving for an hour or so, past various hills and over small ridges, until in the distance loomed an amazing wall of landscape. It looked like an almost sheer cliff rising hundreds of metres above the plain we were on, extending north and south like a wall across the land. It was green with vegetation and had ridges and scoops running vertically. This, explained Timba, was the eastern edge of the African Rift Valley, the Gregory Rift. It looked more and more amazing and otherworldly the closer we got to it. I’ve never seen landscape anything like it before. Our road led us straight towards it, and eventually up it, since Karatu was beyond. Just before the cliff wall was Lake Manyara, stretching away to the south. This is to be our driving goal for tomorrow, when Timba says we should see the tree-climbing lions. He explained that they started climbing trees to avoid the wet, marshy ground around the lake during the rainy seasons. But now the rainy seasons are not as wet and the lions don’t climb trees as much, so we may not see them in the trees, or even at all. 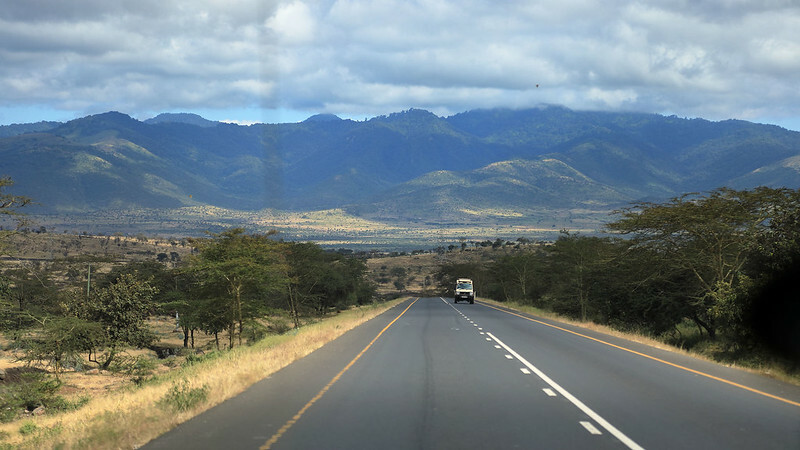 We saw the turn off for Lake Manyara, where we will have to return tomorrow, and then started climbing the steep hill that let the road wind its way up the rift valley cliff wall. As we climbed. Timba pointed out some baobab trees, with their distinctive upside down appearance, thick trunks waving spindly bare branches in the air. Towards the top I asked Timba if he could stop somewhere so I could get a photo of the view. 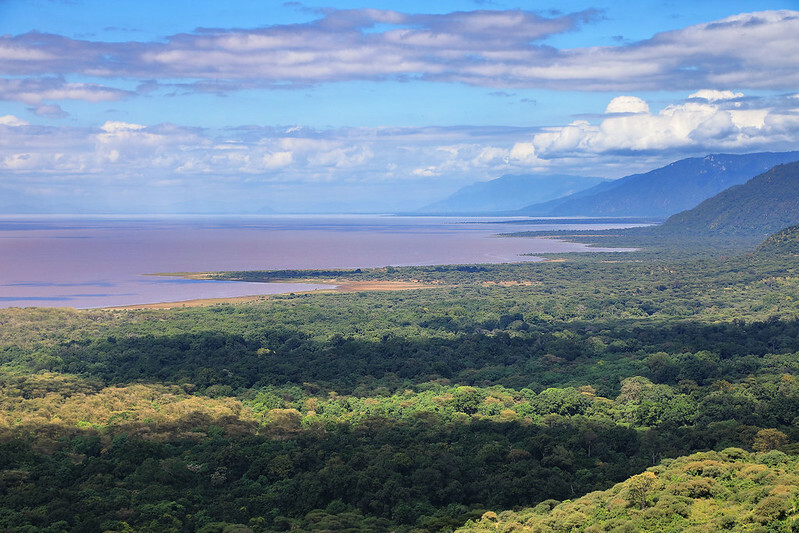 He pulled over at a spot that had been designed as a look out spot, with a short series of concrete steps leading up to a viewing area with a railing, overlooking Lake Manyara and the plain far below. As soon as we got out of the car, two guys approached, trying to sell us cheap souvenirs. We politely declined, but had to ignore them as they wouldn’t stop pestering us. 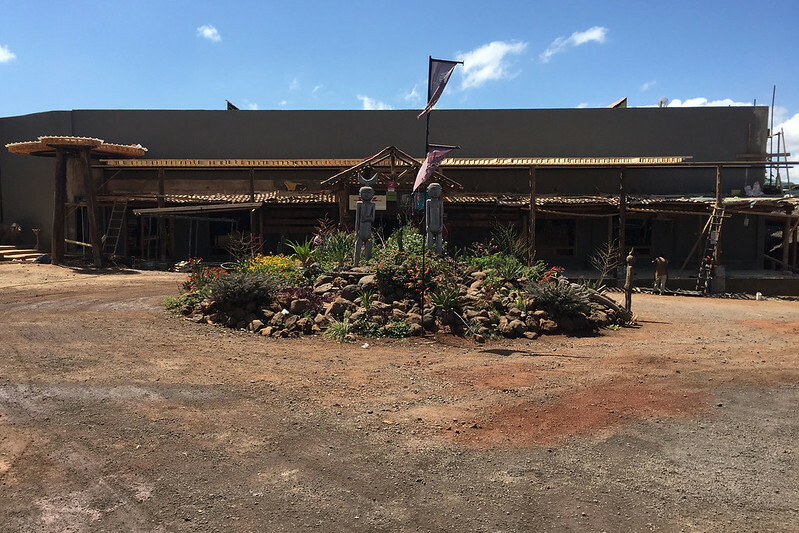 After climbing the scarp onto the plateau above, we stopped at African Galleria, a large souvenir shopping emporium by the side of the road. This was obviously made for tourists, with a wood fired pizza oven in the al fresco cafe outside, and a vast Aladdin’s cave of linked rooms with high ceilings showing off all sorts of things from giant carved poles to wooden masks to animals carved from malachite to T-shirts to trashy souvenir trinkets. Timba said this was a good place for a toilet break as the toilets were very clean and modern. They were indeed. Much refreshed, we browsed around a bit, and M. picked up a woven shopping bag from a staff member as she collected things to take home as gifts. The drive continued. 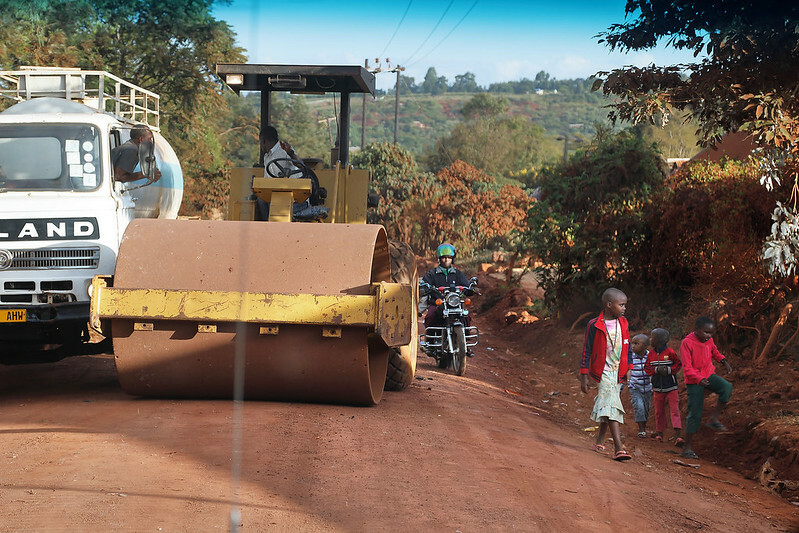 Near Karatu we passed a village where a sign advertised “The Shirt Shack – the best T-shirt shop in Tanzania”. It was a small round mud hut with another sign on it advertising hand painted T-shirts. I was curious to see what they had, but not enough to get Timba to stop. Eventually we arrived at the dusty red town of Karatu. Our accommodation, Acacia Farm Lodge, was on the far side of Karatu, so we got to drive through the middle of the town. As we drove through I spotted that universal constant: a pair of shoes tied together by the laces and slung over a power line. Acacia Farm was off a side road, which was compacted red dirt and very rough and bumpy. The lodge was 1.5 kilometres down this road, past dusty concrete houses and run down farms. Then we pulled up at the lodge and passed through a solid security gate into a walled compound which was a very different world. 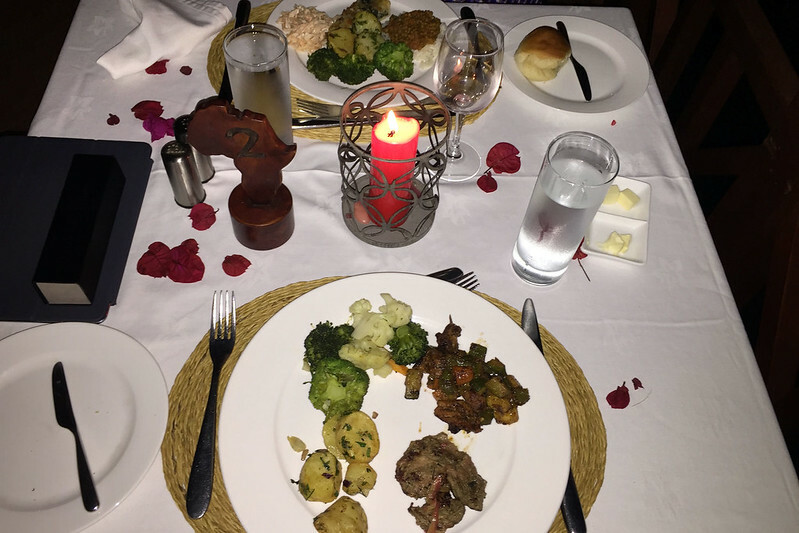 Inside it was a luxury resort, beautifully landscaped with banana trees and a coffee plantation mixed with other vegetation. Staff greeted us at the car with fruit juice drinks and hand towels to refresh ourselves after the drive. What seemed to be the manager introduced us to our personal butler, Godfrey, who would be looking after us for our two day stay here. After checking in and filling in a guest form, Godfrey showed us to out room, which was bungalow 11B, secreted away amidst the trees, with coffee bushes around it. The room, or should I say rooms, was enormous. Just the bedroom was gigantic, with a king sized bed with mosquito netting made to look tiny amidst the open space, which also held side tables, a lounge chair, footstool, writing desk, and desk chair. Adjoining this was a sitting room, with sofa, coffee table, bar fridge, and television. Both these rooms had double doors leading to the balcony, which looked out on greenery that provided privacy from other bungalows. In the other direction was a dressing room, with a full sized closet, and off this an enormous bathroom, with dual sinks, a separate toilet room, and a shower that was larger than many bathrooms. We dropped our things and then went straight to lunch, as it was about 13:00. 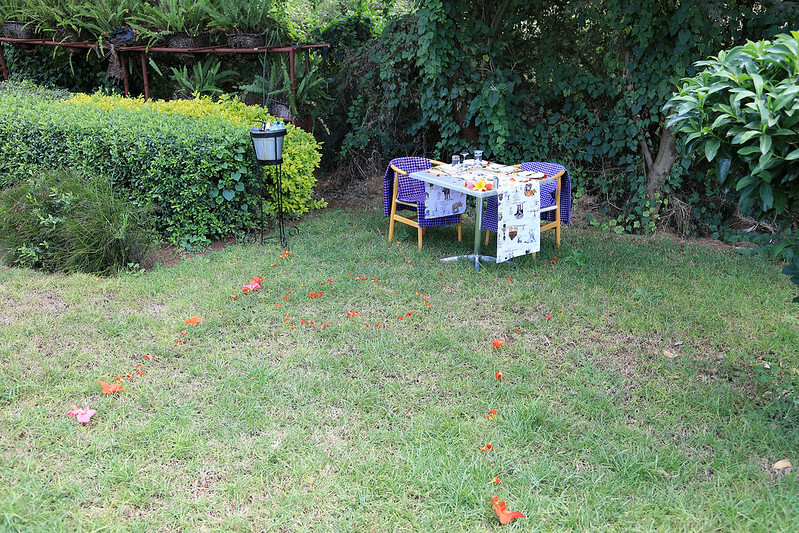 We discovered that Godfrey had set up a table for two in the garden below the reception building, under the shade of a tree. He’d made a pathway lined with red flowers with a heart shape in the middle near the table, which was also scattered with flowers. Next to it was an ice bucket on a stand, with water and two bottles of wine in it. Godfrey sat us down and said he’d have the menu brought to us. This sounded like an a la carte choice, but it turned out that a woman in chef’s uniform came out, introduced herself as the head chef, and recited what she was preparing for lunch: carrot and ginger soup, followed by roast chicken with something I didn’t catch (which turned out, I believe, to be the spices used), green salad, and French fries, followed by a dessert of fruit salad. M. reminded her that she was vegetarian, and the chef said she’d prepare a vegetable pasta dish too. It sounded fairly simple, but when the food came it was amazing. 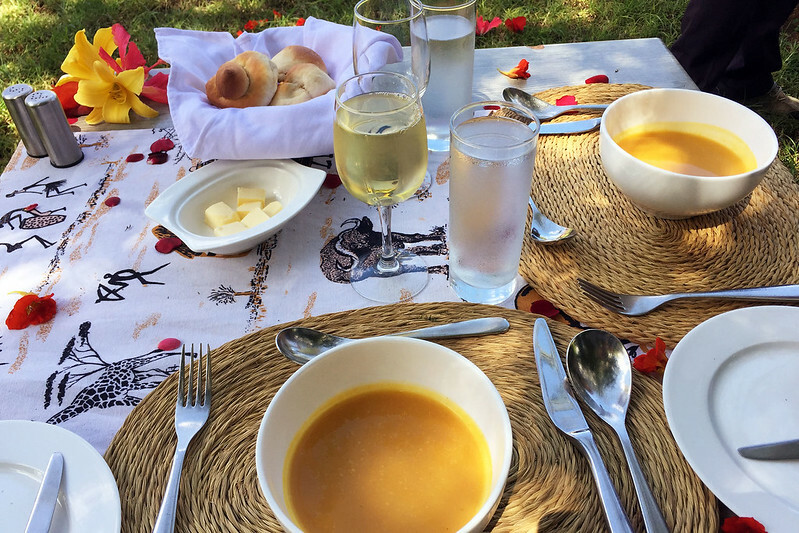 The soup was delicious, served with bread rolls and butter. The chicken came in pieces, covered with a spicy coating that gave it a delicious rich flavour. 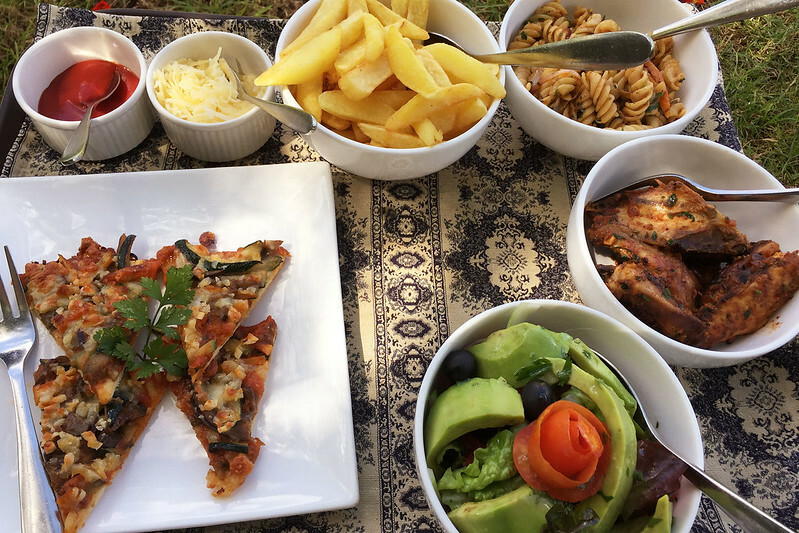 And besides the pasta, there were also four slices of a vegetable pizza, with eggplant and other things on it. We ate our fill, but there was so much that there was quite a bit left over. Then the fruit salad came, thankfully fairly small portions served in martini glasses. After this massive lunch, we wanted to do some walking. 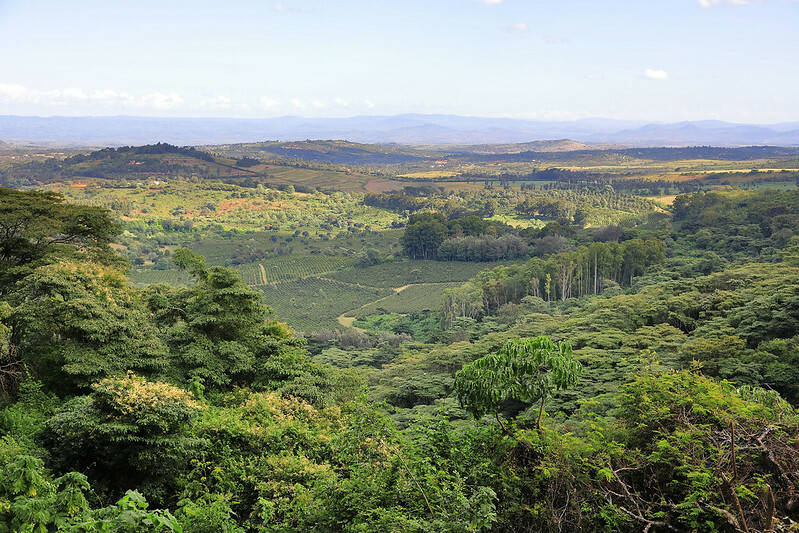 The lodge offers a guided walk around the farm on the property, but listed in our itinerary was also an optional walk through the Ngorongoro Conservation Area forest. We inquired about this, and learnt it cost US$18 each, and that we needed to get transport there. The lodge guy suggested we get a car to take us there and then we could ride bicycles back. But M. doesn’t ride so we said we’d like to drive back as well. The guy said he’d contact Timba for us to take us there and back. He said we needed to be there by 16:00 as they didn’t let people into the park area after that, so Timba would pick us up at 15:00. We just had time to freshen up in our room and then meet him at the car. He drove us back through Karatu and then down another dirt road off the main road. This one was in the process of being resurfaced by a grader as we drove along it, passing to one side and then over a tumble of freshly churned rock and dirt. The road was several kilometres long and very bumpy. It would have been some bicycle ride returning this way! Eventually we arrived at the conservation area, where a small building served as an administrative block. We had to sign in and were issued with a pass permitting us to enter the park. 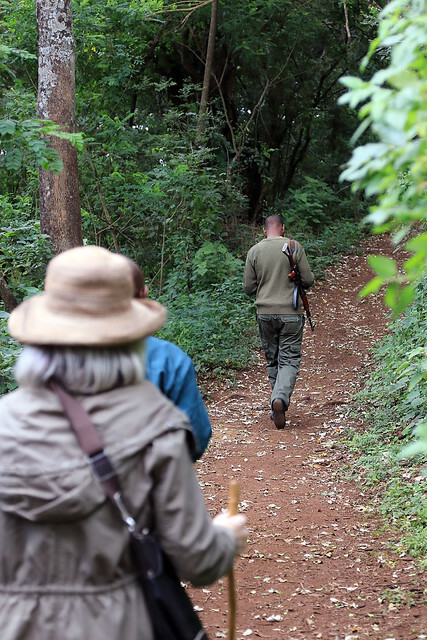 Timba explained that a park guide would accompany us on the walk, as well as an armed guard. The guard carried an assault rifle, which the guide explained was in case we encountered any wild animals that decided to charge at us. We set off down a narrow walking path through the forest. 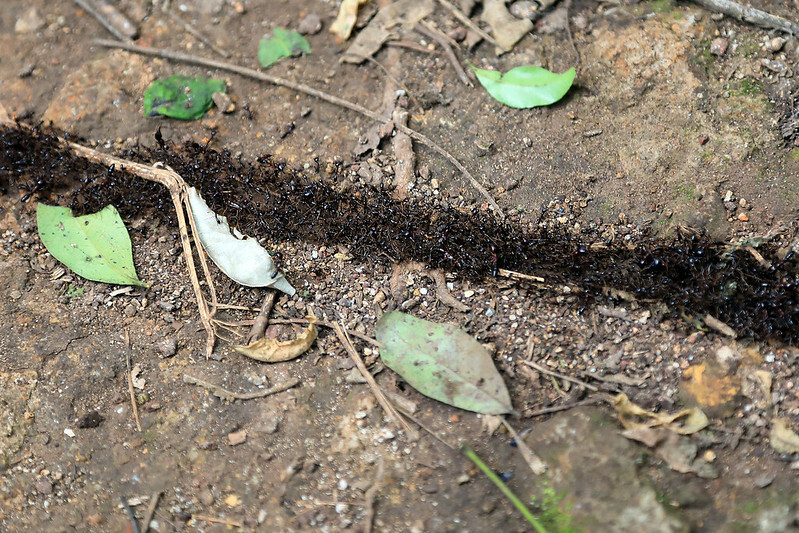 Our guide pointed out a trail of ants crossing our track, the trail about two or three centimetres wide, paved with ants crawling along. He said to be careful and step well over them as they bite. A bit later on we saw another two ant trails near one another. The guide also pointed out elephant droppings on the path, and showed us incredibly narrow trails leading off through the forest that he said were elephant trails. 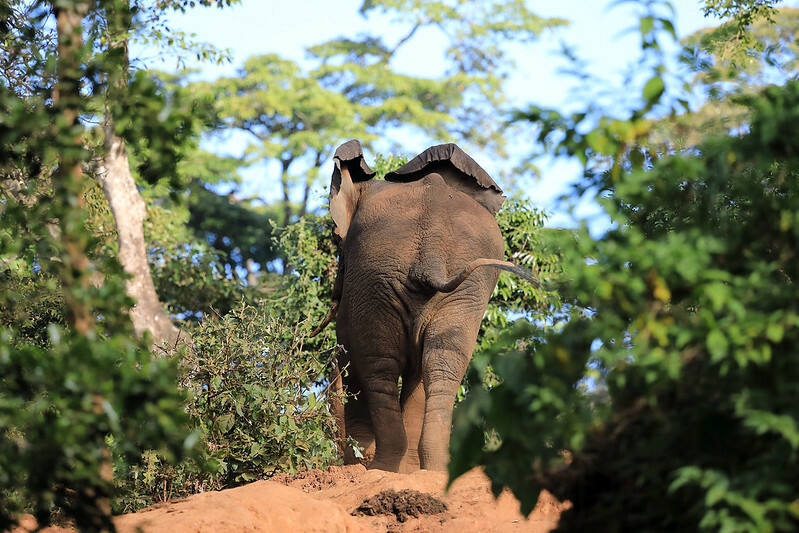 It was incredible to believe that animals as large as elephants could use trails so narrow, and so steep as some of them tracked off up or down the hillside. He also showed us some of the plants along the trail, including one with large, soft, smooth leaves, that you could use as toilet paper, and a couple of medicinal pants with distinctive smells when he crushed some of the leaves. He also pointed out stinging nettles, which you definitely didn’t want to use as toilet paper. 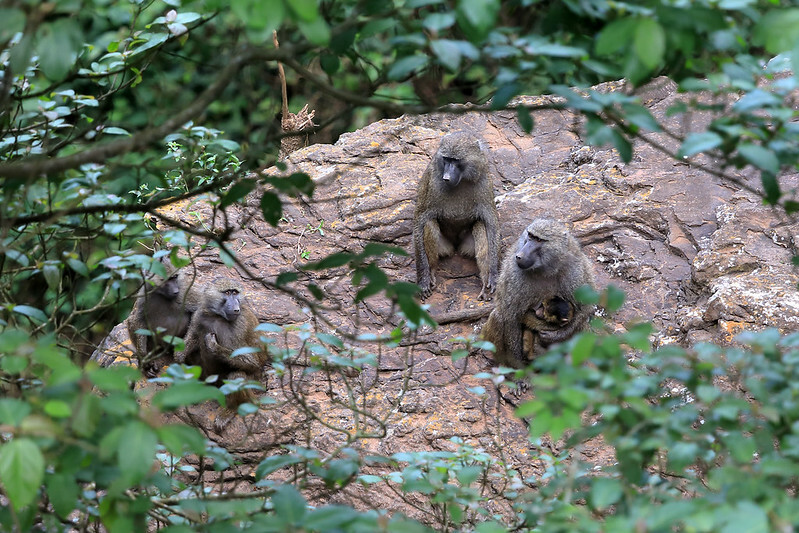 Then at one point we stopped and the guide pointed out some baboons hiding in the foliage. They retreated away from us, so we continued on, ascending the hillside, and then eventually descending to a narrow valley where a stream ran below some bare earth hillside. This was the elephant “cave”, where elephants come to dig the earth and eat it to get mineral nutrients. And there were a couple of elephants there, just leaving as we arrived. The guide said these were males, and we must have just missed a larger group with females and young who would have left before the males. We saw them from across the stream, maybe about 50 metres away as they walked up the hillside and disappeared into the trees. On the way back we took a detour to a waterfall, where the stream ran over a cliff edge into the valley far below. We stopped here to enjoy the view, and then noticed a group of baboons at the base of the falls. I tried to take some photos, but they were a bit obscured by foliage. The guard stepped down over the edge of the cliff adjacent to the waterfall and onto a small stone ledge, where he could lean back against the cliff wall, but essentially be right on the edge. He invited me to step down too and we shared the tiny space while I leaned over and took some photos. Later, M. said that our guide had been behind me, ready to grab me in case I started to fall. We left the waterfall and walked back the way we’d come. 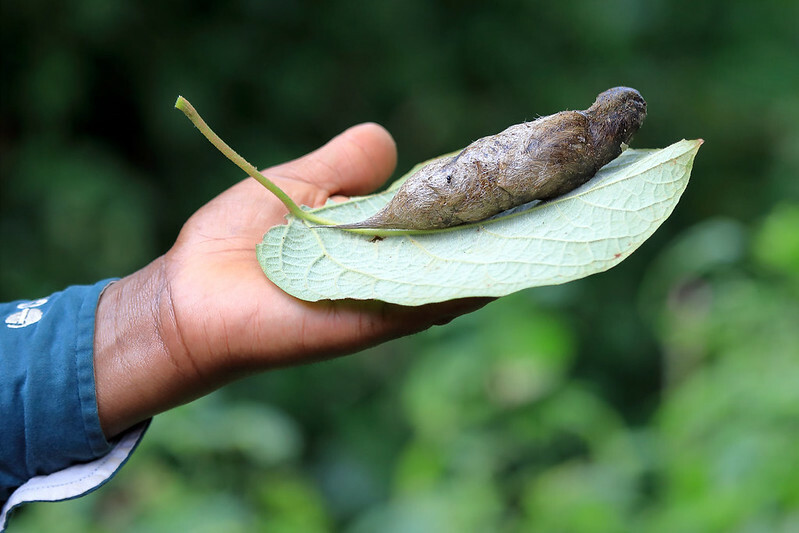 The guide pointed out a different sort of poo on the path, saying it was “very stinky, baboon poo”. We carefully avoided stepping in it. A bit later he found leopard droppings too, pointing out how the leopard eats animals skin and all, so the droppings come out coated in hair. He picked up a piece using a leaf so I could get a close photo. Back at the park entrance, we rejoined Timba. The rest of the park staff had knocked off for the day, and he said we were giving our guide and guard a lift back to town. They climbed into the Land Cruiser behind me and M. We dropped the guide back near the middle of Karatu, and then took the guard down a dirt side street to the police station; presumably he was a police officer and may have had to check his gun in before heading home. Timba returned us to the lodge, where he said he’d pick us up at 07:00 tomorrow for our first game drive, to Lake Manyara National Park. We dropped past our room for a bit before dinner, then emerged at 19:00 to go down to the lobby and sit for a bit using the WiFi before dinner, which began at 19:30. Godfrey appeared and asked if we wanted any drinks. I asked for a gin and soda, while M. got a glass of South African Shiraz. Downstairs on the lawn we could see the bonfire which the staff had lit for guests to sit around before dinner. The lobby verandah and lawn face west, where the sun had set behind the Ngorongoro hills, and now Venus and stars were shining down. At 19:30 we moved across to the adjacent restaurant building. They had tables set up on the verandah facing west. Godfrey had said when showing us our room that they don’t have a real problem with mosquitoes here in Karatu, despite the mosquito net over the bed. But here we were being shown to a table in the open air with candles burning and attracting insects. It seemed nobody was worried by the possibility of mosquitoes, and indeed we didn’t notice any all evening. 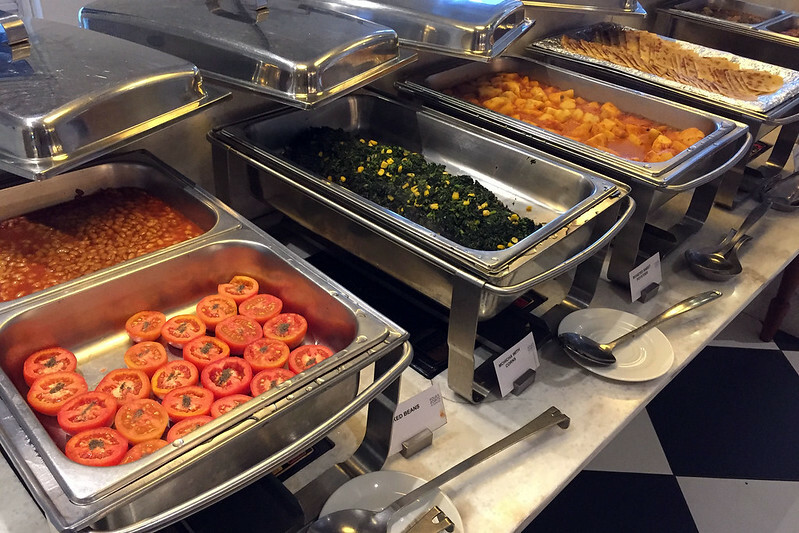 Dinner was, thankfully, a buffet, so we could choose a light meal after the lavish lunch we’d been served. There was a chef preparing pasta dishes to order, using cooked spaghetti and ingredients for any sauce you wanted, then a buffet of hot food including a a spicy pork and vegetable dish, thick slices of beef which were soft and tender, a variety of vegetables and roasted potatoes, rice, dhal, and a large selection of salad types and ingredients. There were also two soups for starters, French onion, and potato and lentil, plus breads. M. chose the potato lentil soup and said it was good, while I chose the onion soup and found it a bit weak and brothy, rather than thick like I like it. The beef and pork were both very good. I tried some of the same Shiraz with my meal. We had fairly small serves to make up for the huge lunch, but I saved some room for a small slice of rich looking chocolate cake. When I went to get it, a server was there and also put a mini creme caramel on my plate, and who was I to argue? It was nice, but the cake wasn’t as rich as I expected. Dinner done, we retired to our room to clean our teeth, have showers, and get to bed by 22:00 so we could get up at 06:00 in time for breakfast before meeting Timba tomorrow. This entry was posted on Friday, 3 August, 2018 at 12:24	and is filed under Diary. You can follow any responses to this entry through the RSS 2.0 feed. You can skip to the end and leave a response. Pinging is currently not allowed.